Product prices and availability are accurate as of 2019-04-05 03:41:07 EDT and are subject to change. Any price and availability information displayed on http://www.amazon.com/ at the time of purchase will apply to the purchase of this product. Manufactured in Germany, these high performance diapers are 'EcoCert' certified biodegradable and compostable. Dermatologically certified as 'especially skin friendly' make them suitable for babies with eczema, diaper rash, sensitive skin. Packed in a compostable bag. Wood pulp in the core from EFC certified renewable forestry. 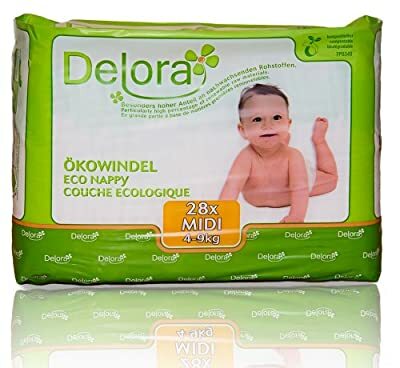 These diapers offer the convenience of a disposable diaper whilst reducing the impact on landfill. Available in four sizes to suit babies from 6.6 lb. up to 55 lb.